I’m not sure if I ever wrote a post about this painting, but this is a painting I did in 2012 of my grandmother and I (we call her Mamaw). She was having lots of health issues and was really in bad condition in the hospital, so I flew out to see her in Ohio. At the time, I really thought that she wouldn’t be with us for much longer. It turns out that I was only half right…she made it out of the hospital and is still alive today, albeit now in a nursing home and with Alzheimer’s. My grandfather, who we called Papaw, was in much better condition at the time. Sadly he passed away earlier this year…before my grandmother! He must have seen that she wasn’t in such good condition, and thought that he had to go first. I wasn’t ever as close to Mamaw as I was with my maternal grandmother, but Mamaw was always sweet to me, though she definitely has a sharp mouth, sarcastic humor, and can ‘dish it out’ as well as she can take it. So in the end this wasn’t exactly goodbye, though in some ways it was, what with the Alzheimer’s. In either case, I thought this painting would be something many people could relate to. I really like this and the story behind it. And yes, so many of us can relate. How very touching. I remember my mother’s hands, unresponsive due to Parkinson’s but it is through holding hands that we connected and comforted each other. Beautiful. Thank you for sharing that Lidia. 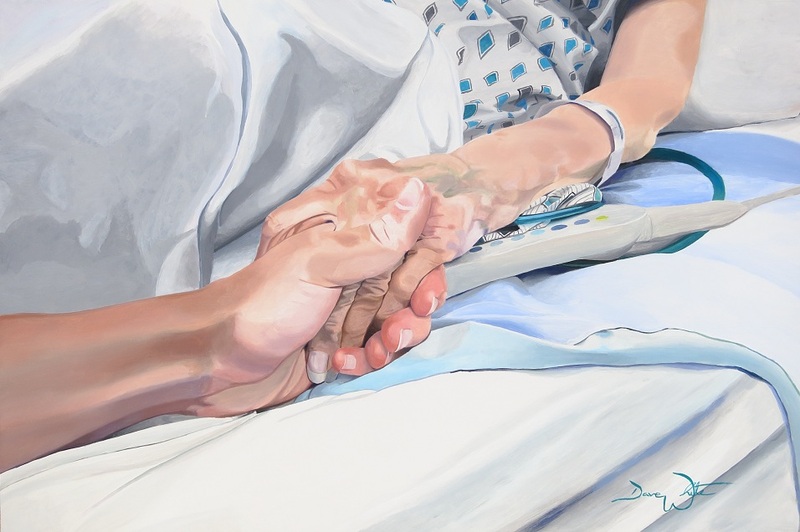 Touch has been a comforting way to connect and communicate for me, such as you describe, when spending time with someone near the end of their life. Wonderful painting! the color and representation is amazing!